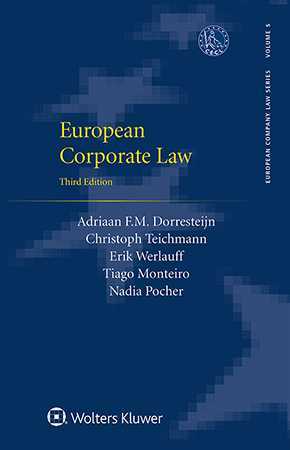 European Corporate Law is the fully updated new edition providing the best-known practical overview of the law regarding companies, business activities, and capital markets in Europe, at the European Union (EU) and Member State levels. The characteristics of national company laws and political incentives remain, of course, a slackening combination to those who are convinced that acceleration of harmonization within the EU is the way to go. Seen from a distance, however, differences in national company laws are often related to details, the importance of which should not be overrated. The book incorporates analysis of recent developments, including the impact of global initiatives in such aspects of the corporate environment as regulation of financial institutions and non-financial reporting obligations with a view to sustainability and other social responsibility concerns. safeguarding of employee involvement in cross-border transactions. With respect to national law, the laws of Belgium, France, Germany, the Netherlands, Poland, Spain, and the United Kingdom (UK) are taken into account; Italy is now included in this new edition. The selection of countries may be debatable, but the book aims at including examples of continental European legal systems as well as the common law system of the UK. This Third Edition will continue to be of great value to practitioners and academics who wish to acquire a better understanding of European corporate law, in its supranational dimension as well as in the similarities and differences among the various national legal systems. It is also a springboard for further research on topics dealt with or mentioned briefly in the book such as liability of directors, corporate governance, cross-border acquisitions, digitalization of company law, cross-border insolvency, and pre-insolvency restructuring.